As time goes by, children's interests change as their needs change. 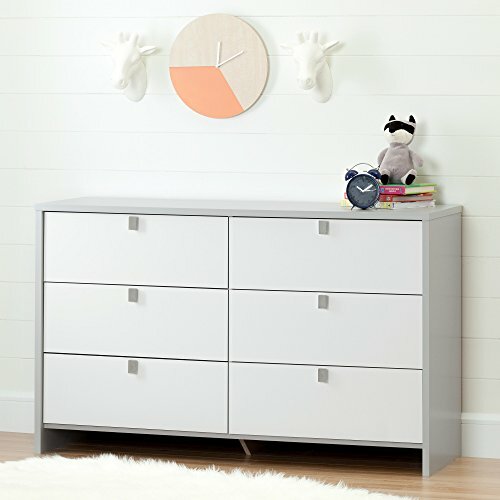 This dresser from the Cookie collection allows the continuous evolution of a room, while adapting to each child's age and needs. Works great in kid's room or nursery. Metal handles in a Chrome finish. Metal drawer slides. Drawer dimensions #1: 22.625'' (L) x 13.625'' (D) x 5.5'' (H). Meets or exceeds all North American safety standards. Accessories not included. Requires complete assembly by 2 adults (tools not included). 51.625'' (W) x 18.25'' (D) x 31.375'' (H). Box dimensions: 59.21'' (L) x 19.02'' (W) x 7.6'' (H), 131 lb. Ships in a heavy box, make sure to have a friend with you. Packaging tested and certified to reduce the risk of damage during shipment. Made in North America with non-toxic laminated particleboard. 5-year quality guarantee. Any questions? Contact South Shore, the manufacturer, available 7/7 by phone, email or chat.